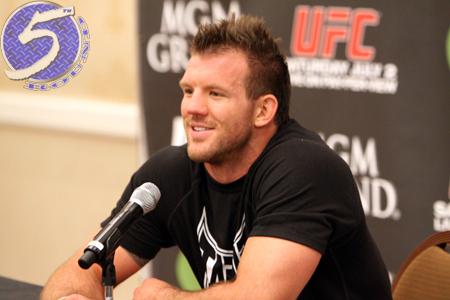 While Tito Ortiz was fuming when he discovered Forrest Griffin was prescribed Testosterone Replacement Therapy for their fight at UFC 148, Ryan Bader (Pictured) told 5thRound.com that he couldn’t have cared less that Quinton “Rampage” Jackson was taking the controversial treatment for their scrap at UFC 144. The pill was probably easier for Bader to swallow considering he walked away with a lopsided unanimous decision victory over Rampage, while Ortiz was forced to retire on the wrong end of a decision defeat. Speaking of “The Huntington Beach Bad Boy,” Bader revealed that his upset loss to Ortiz at UFC 132 was the most humbling experience of his professional career. However, the 29-year-old turned that negative into a positive by making significant changes in his life. Bader faces Lyoto Machida this Saturday at “UFC on FOX 4.” With an impressive showing, “Darth” can punch his light heavyweight top contender ticket.